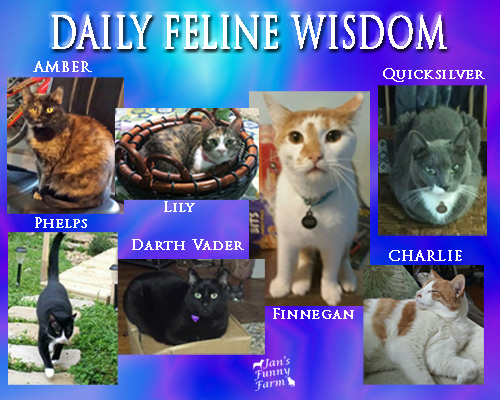 Many purrs to the Funny Farmer Felines for interviewing us!!! It’s perfectly all right to dress up like us, though. Even if you don’t get it quite right, we appreciate the effort. *Unless we do. Some cats like dressing up. Ask your kitty to be sure. My pet peeve – if people like dressing up others for Halloween that much, why don’t they get kids? Or a puppy. Dogs don’t necessarily appreciate the indignity of wearing a costume. Some of them actually like it. Happy Halloween. Jan isn’t dressing any of us up since we don’t like it. Well, sometimes the dogs do a little. Dogs are different. They aim to please whereas we cats aim to be pleased. Hopefully, your mom isn’t dressing any of the dogs up like a hot dog. Even for a dog, that’s just too undignified.